Home / Unlabelled / Buhari May Not Sack Aisha Alhassan, Here Is WHY. Buhari May Not Sack Aisha Alhassan, Here Is WHY. President Muhammadu Buhari may not sack Minister of Women Affairs Aisha Alhassan despite calls for her to get the push following her comments, a source said yesterday. Sen. Alhassan shocked many when she said she would not support Buhari, should he decide to run in 2019. Her loyalty, she said, is to former Vice President Atiku Abuabakar. This is the third time the minister has made such comments against the President and his administration. The minister was alleged to have visited Peoples Democratic Party (PDP) national caretaker chairman; lambasted the administration during a session at the national secretariat of the All Progressives Congress (APC); and the Sallah homage to ex-Vice President Atiku Abubakar in Yola. 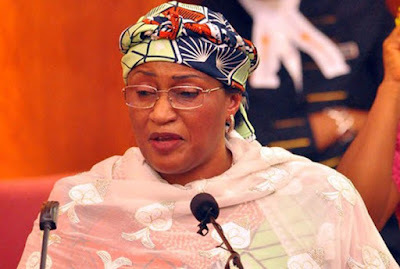 A member of the President’s kitchen Cabinet, who spoke in confidence, said Buhari knew Senator Alhassan as a die-hard Atiku loyalist before appointing her as a minister. The source said: “Buhari is not going to sack or dismiss her. The attitude in the Presidency is to let her go on her own if she has 100 per cent loyalty to ex-Vice President Atiku Abubakar. “Some of you may not know that this is not the first time the minister has attacked the President and his administration. “Aisha’s loyalty to Atiku is not new to the government. She has been with him all along as well as during the presidential primaries. It is nothing new. “And for Aisha to say that she was appointed a minister on the basis of her strength is false. The President appointed her on the basis of his conviction despite her loyalty to Atiku. Even the near miss she had with the governorship election in Taraba State was because of Buhari. Without Buhari’s popularity, she would not have garnered votes as much as she did. Another source said some of the President’s strategist met at the weekend and opposed Sen. Alhassan’s sack. The “strategists” met in Abuja and concluded that taking action against the minister might cause distractions for the administration. “We want her to remain in government and exercise her freedom of expression to the fullest. No one will tamper with her rights and privileges. We need to learn from the past. “We also want to demonstrate that there can be opposition in a government without any consequences. This is the essence of democracy,” the source said. Also yesterday, Senator Alhassan denied threatening to expose Kaduna State Governor Nasir El Rufai’s alleged role in the kidnap of the Chibok girls. According to her, those behind the statement were out to tarnish her image. A statement relased by her in a text message to our reporter, said: “The attention of the Minister of Women Affairs, Senator Aisha Jummai Alhassan has been drawn to a statement allegedly made by her against Governor Nasir El Rufai. “The statement allegedly made by her is another ploy by mischief makers to tarnish her hard earned reputation. “The current APC government under President Buhari inherited series of problems from the past administration; the kidnap of the Chibok girls by the dreaded Boko Haram happens to be one of them and President Buhari and our military had been able to rescue some of them and checked Boko Haram’s excesses. Their own cup of tea..